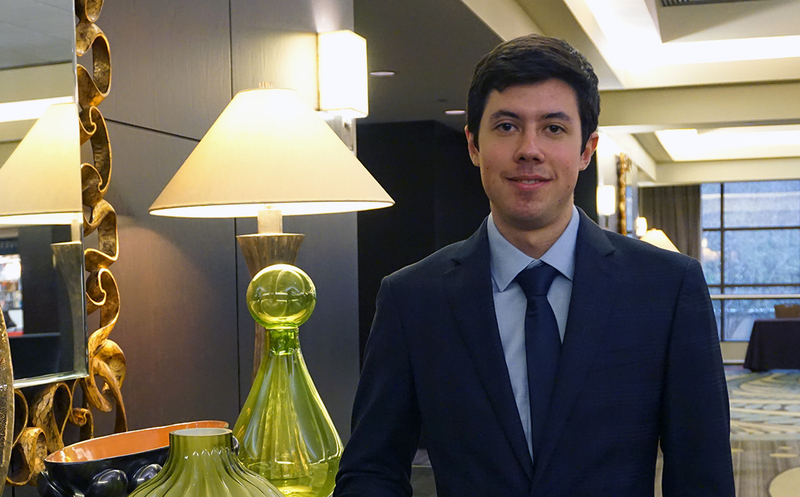 As the only student to attend the 17th Annual CIO Summit in Seattle, junior Juan Jesus Trevino came back to Hilton College with a wealth of professional connections and valuable information about the newest technology trends in the hospitality industry. The event, held this year from Sept. 5-7, is produced each year by Hospitality Upgrade magazine under the leadership of president and publisher Rich Siegel. Participants, admitted by invitation only, include chief information officers and executives from hotels, management companies, cruise lines and gaming. Trevino received this opportunity thanks to the John Cahill Honorary Seat, an award that stemmed partly from his membership in the Hospitality Financial and Technology Professionals (HFTP) Cougar Chapter. The award, created by Hospitality Upgrade in 2016, honors the memory of John Cahill, a hotel technology advocate with an extensive list of industry contributions, including co-editing the inaugural Certified Hospitality Technology Professional (CHTP) exam in 1995. Cahill was inducted into the HFTP International Hospitality Technology Hall of Fame in 1993. Each year, Hospitality Upgrade selects one deserving student from a university or four-year college with a hotel management program. HFTP Faculty Advisor Arlene Ramirez said a panel of judges, including Dean Dennis Reynolds and Dr. Agnes DeFranco, also a chapter faculty advisor, selected Trevino to represent the College based on his knowledge, passion and potential in this segment of the industry. In the summer of 2016 and 2017, Trevino helped complete a major network upgrade that involved rewiring and installation of new devices at Arenas Del Mar, an 80-room resort hotel in Tampico, Mexico. Trevino plans to graduate in 2020 and continue a career in the lodging industry. At the summit, Trevino said he appreciated the interactive nature of the sessions, including a private tour of Boeing’s The Future of Flight Aviation Center in Mukilteo, 25 miles north of Seattle. After the tour, Boeing Global Services’ Duane Wehking, vice president of Information Technology Business Partners, and Ken Shaw, vice president of Supply Chain, joined the participants for dinner and a presentation.